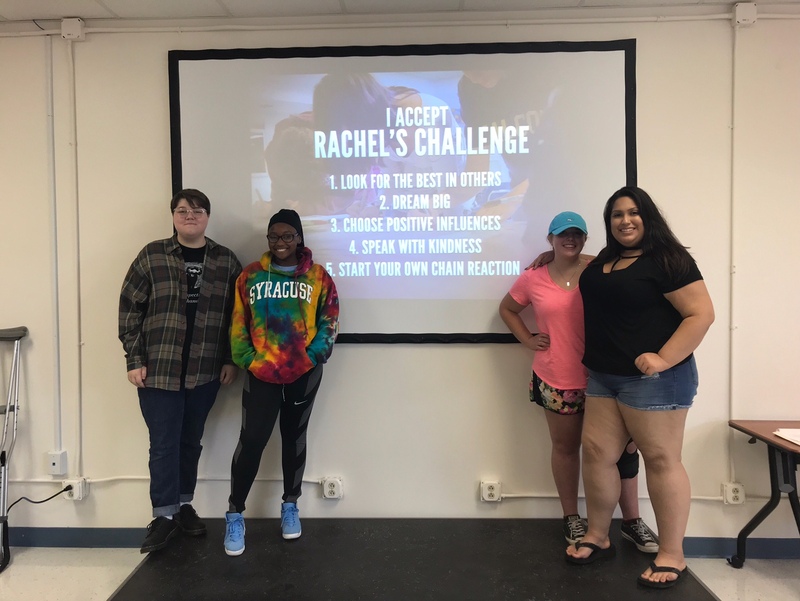 Rachel’s Challenge is going gangbusters at schools throughout OCM BOCES, with students and staff enjoying “high-five Fridays,” complimentary popcorn, walls of inspirational quotes and many more activities designed to promote and sustain a culture of kindness in our schools. In September, students and staff in every building heard emotional presentations from the organizers of Rachel’s Challenge, a program that evolved from the deadly Columbine High School shooting in Littleton, Colorado, on April 20, 1999. In that tragedy, 16-year-old Rachel Joy Scott was the first of 13 students killed in the shooting. 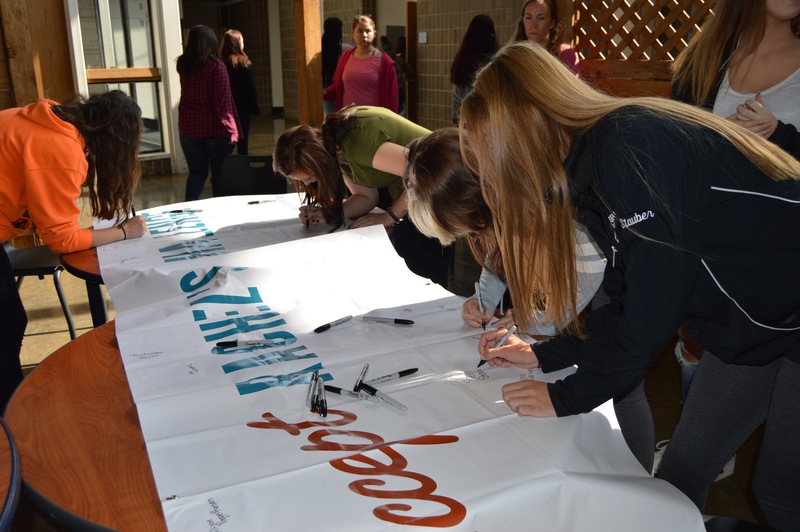 At OCM BOCES, hundreds of students and staff have signed their names to large banners, pledging their belief and commitment to the five tenants of Rachel’s Challenge. They are also forming “Friends of Rachel” (FOR) Clubs and planning other activities to promote kindness in schools. 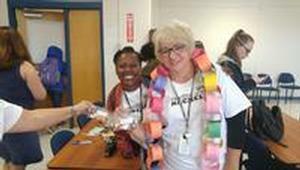 At Innovation Tech, students have made paper chains in which every link describes an act of kindness they have seen, done or plan to do. The FOR Club has passed out bags of popcorn to every student and staff with inspirational quotes from the Rachel’s Challenge program. They have also gathered hand prints from students and faculty for an inspirational wall and have talked about the FOR Club to Crossroads students in the same building. 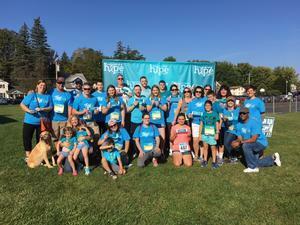 Finally, students and staff participated in the local Teal Ribbon Run and raised $800 to support the fight against ovarian cancer. The FOR Club in the Career & Technical Education program at the Cortlandville Campus initiated “High-Five Fridays” for the entire building. When juniors and other students enter the campus on Fridays, they are welcomed with high-fives. In the same vein, seniors have initiated “Chill Out Fridays” as a chance for them to hang out, color and talk about their week. Students have also made paper kindness chains, posters with inspirational quotes and a “window” of quotes for all to see. They are currently planning community events and other activities. At our Crossroads programs at Crown Road, students met Sept. 29 and heard from Innovation Tech members about the challenges in their lives and why they wanted to be part of the FOR Club. At the same meeting, students started a paper chain of kindness, signed up for the FOR club and took home a bag of candy with a kindness quote. 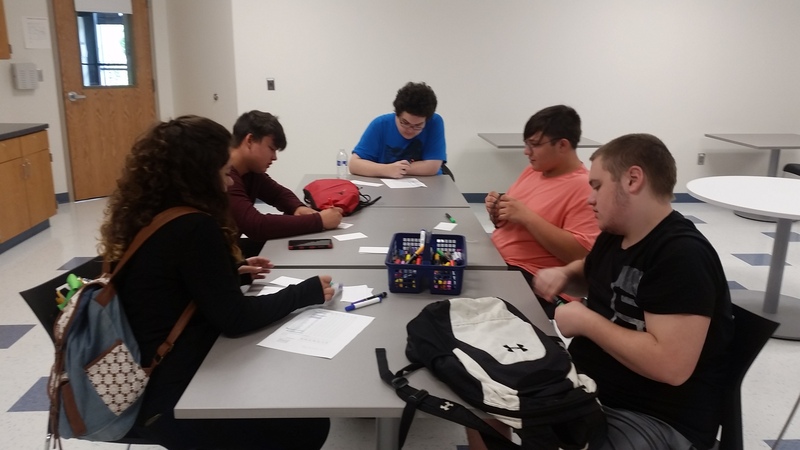 Later, the 18 Crossroads students who joined the FOR Club listened to information and expectations for the group and signed up for different roles and committees. They also enjoyed ice cream sundaes, listened to one of Rachel’s school essays — “My Ethics, My Codes of Life” — and shared their reasons for joining. In the Adolescent Day Treatment (ADT) program at Thompson Road, students have made a banner with their handprints, pledging their commitment to Rachel’s Challenge. They also created a tri-fold presentation to share at Open House and are hoping to start a clothing drive this winter that ultimately mimics Rachel Scott’s closet idea, allowing students to pick out clothes they can use for themselves before the rest is donated. At Seven Valleys New Tech Academy in Cortland, students put their handprints on a prominent wall to pledge their commitment to Rachel’s Challenge and are now preparing for a special “Kindness Week” starting Oct. 23 to promote a community of caring. One idea for the week is “Thoughtful Tuesday,” when each student at the school will receive a bag of Hershey hugs-and-kisses candy with an inspirational quote. Students in our full-time Adult Education programs donated $576.76 Oct. 5 to the local chapter of the American Red Cross to assist victims of the latest hurricanes. Literacy students under instructors Kathy Elbadawi and Colleen Bader collected the most change for the donation. The students are in English to Speakers of Other Languages (ESOL) classes and represent more than 15 countries across the globe. The students called it a "change reaction of kindness." 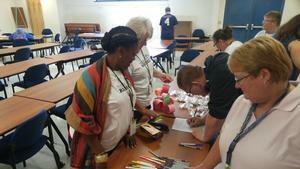 STARS Program: FOR Club members created "Nice Notes" for individual students within the program. Students put positive comments on index cards with student names and placed them on windows throughout the building. Students also elected club officers and decided to organize a clothing/food drive for students called "Joy's Outlet." 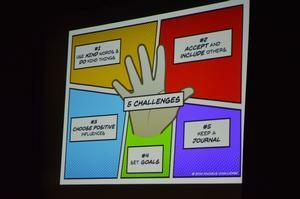 Students also set up a display table with pamphlets about Rachel's Challenge during the STARS Open House.